The capability modeling and simulation (M&S) supplies for managing systems complexity and investigating systems behaviors has made it a central activity in the development of new and existing systems. However, a handbook that provides established M&S practices has not been available. Until now. Modeling and Simulation-Based Systems Engineering Handbook details the M&S practices for supporting systems engineering in diverse domains. It discusses how you can identify systems engineering needs and adapt these practices to suit specific application domains, thus avoiding redefining practices from scratch. Although M&S practices are used and embedded within individual disciplines, they are often developed in isolation. However, they address recurring problems common to all disciplines. The editors of this book tackled the challenge by recruiting key representatives from several communities, harmonizing the different perspectives derived from individual backgrounds, and lining them up with the book’s vision. The result is a collection of M&S systems engineering examples that offer an initial means for cross-domain capitalization of the knowledge, methodologies, and technologies developed in several communities. These examples provide the pros and cons of the methods and techniques available, lessons learned, and pitfalls to avoid. As our society moves further in the information era, knowledge and M&S capabilities become key enablers for the engineering of complex systems and systems of systems. Therefore, knowledge and M&S methodologies and technologies become valuable output in an engineering activity, and their cross-domain capitalization is key to further advance the future practices in systems engineering. This book collates information across disciplines to provide you with the tools to more efficiently design and manage complex systems that achieve their goals. Introduction. Domain-Specific Languages. Model Repositories. Model-driven Systems Engineering. Collaborative Environments. Simulation Algorithms and Performance Engineering. Simulation Software Architecture. Processes. Verification, Validation & Accreditation. System Modeling. Enterprise Architecture. Advanced Concepts. "… a unique, and much needed, modeling and simulation based perspective of systems engineering. … The authors should be commended for pulling together the contributions of so many experts in the field. … covers both the foundational topics as well as a breadth of application areas. 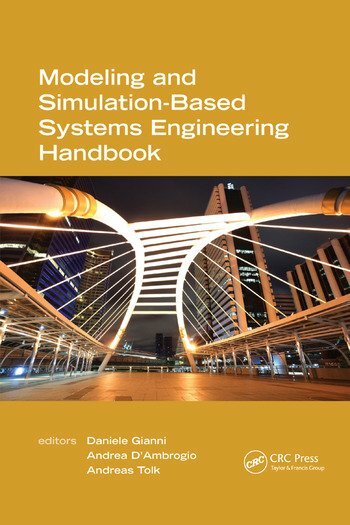 Anyone interested in modeling and simulation and/or systems engineering will find this a good handbook to have on their shelf!" "Comprehensiveness is what characterizes this work — instead of having to wade through disjointed discussions on topics related to Systems Engineering that are scattered through a myriad of journals and books, various aspects of the subject are now treated in one volume in a logical, integrated manner — with sufficient details in such a way that the volume can also be used as a sourcebook for anyone to quickly look up a particular item. … highly recommended …"
The authors have to be congratulated for the high quality of their contributions. … I would highly recommend this book to professionals, researchers, and graduate students involved in complex systems. They may find valuable knowledge about simulation-based systems engineering which is indispensable for the study of complex systems."